Minister of Defense of Azerbaijan, Colonel General Zakir Hasanov on Thursday held an official meeting with the command staff of the army, the Defense Ministry said Nov. 8. The meeting was attended by deputy defense ministers, commanders of the branches of troops, chiefs of the main departments, departments and services of the ministry, as well as commanders of the Army Corps. 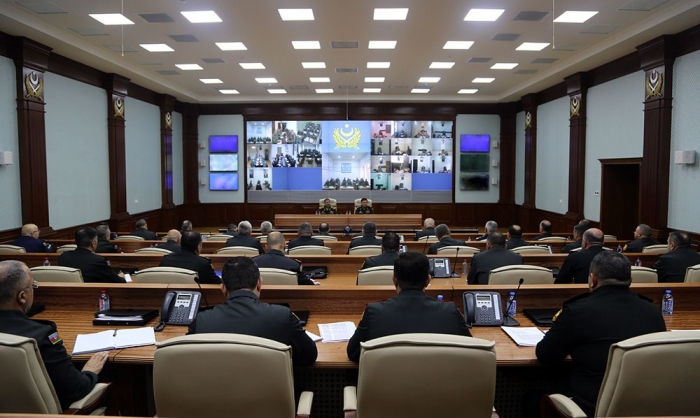 Commanders of the military formations stationed in the frontline zone and other responsible officers joined the meeting via video communication. The defense minister brought to the military personnel the tasks assigned by President of Azerbaijan, Supreme Commander-in-Chief of the Armed Forces Ilham Aliyev, to the Azerbaijani Army, and gave specific instructions on the timely and qualitative solution of issues arising from these tasks within the troops. Minister Hasanov instructed to focus on the continuous control of troops and the proper organization of interoperability with the use of the latest, including space technologies in the course of the Command-Staff War Games. Referring to the situation on the front line, Hasanov noted the importance of paying particular attention to improving the combat capability of troops, the level of combat readiness of military personnel, discipline and vigilance in the organization and carrying out of combat duty, and the completion of preparatory work for the winter period. Congratulating the personnel on the occasion of the State Flag Day and the Constitution Day of the Republic of Azerbaijan, the defense minister instructed to hold a high-level Open Doors Day for parents and relatives of soldiers, as well as military oath ceremonies in all military units.